The tranquil Sapodilla Bay Beach. Sail Beluga at Leeward, Providenciales. 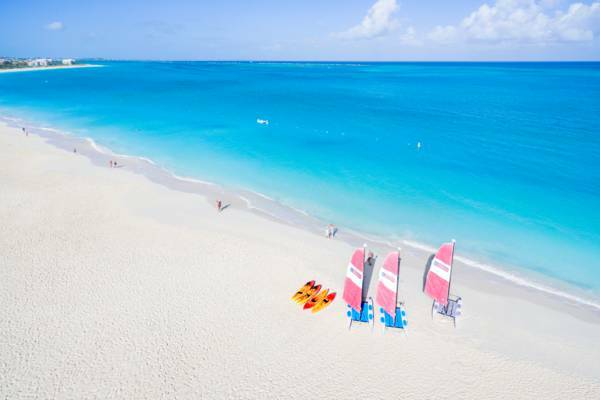 The Turks and Caicos is a spectacular family vacation destination. This guide is intended for families with children staying on the island of Providenciales. This guide is largely not applicable for families staying at the expansive Beaches all-inclusive resort. We generally advise that all guest rent a car for their stay. Rates start at well under $40 per day, and having your own transport is very convenient. Kids usually love the beach, so planning elaborate excursions to all of the possible sights often isn’t required for a great vacation. The unrivaled Grace Bay Beach on Providenciales. 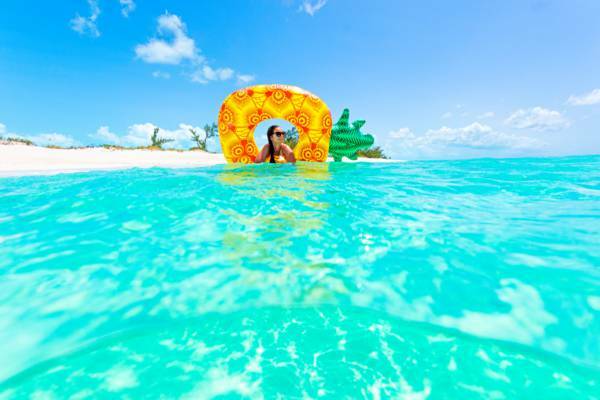 Arriving residents and visitors to the Turks and Caicos are allowed certain customs duty exemptions, so if you have luggage space, consider bringing in some snacks. See Importing Food. The sun can be quite intense in the Turks and Caicos, and you’ll definitely want to bring sun screen (please use reef safe) and long sleeve rash guards. Consider Bugaloo’s, Da Conch Shack, Sharkbite, Pizza Pizza (Grace Bay), Mango Reef, Graceway Gourmet (for takeaway), and the pizza garden at Bella Luna. A few restaurants on Providenciales have a family-friendly ambiance and setting. Sharkbite in Turtle Cove is in the marina and on the water, and the fish and occasional shark swimming by are interesting to watch (sit near the water). Bugaloo’s and Da Conch Shack are located right on the beach, so kids will have something to do while you wait for the food. There are some great ice cream and dessert places to try! Turk Berry is located at the Saltmills Plaza and offers frozen yogurt, Patty Place serves Jamaican style ice cream and pastries, and Island Scoop and Giggles have good old fashioned ice cream. All international flights to the Turks and Caicos arrive at the Providenciales International Airport. During the summer and fall months, it typically takes about 30-40 minutes to clear immigration and customs and collect luggage. The winter and spring " high season" often experiences longer waits, with peak arrival times possibly having waits of well over an hour. An expedited Fast Track service is available, costs $60-100 per person. This service allows passengers to bypass queues. 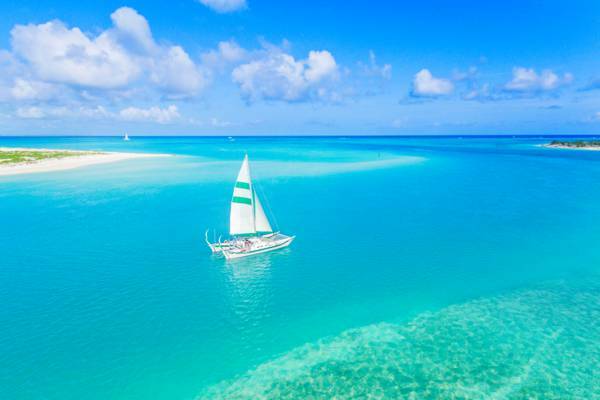 There are so many incredible beaches to discover in the Turks and Caicos! 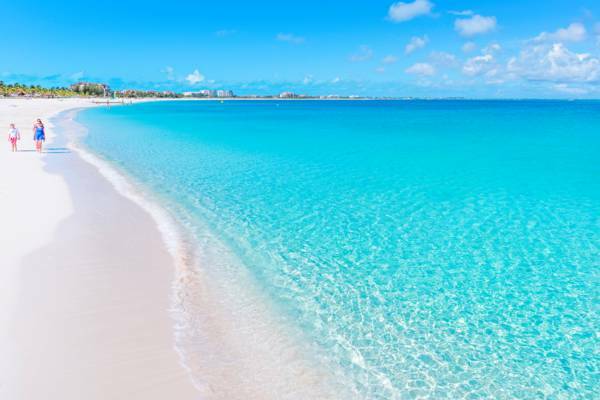 A perfect way to spend your first day in the Turks and Caicos is simply to enjoy the beach, and Providenciales has plenty of choices. Most accommodations are near a spectacular beach, be it Grace Bay Beach, the Bight Beach, or Leeward Beach, so get out and enjoy them. If you’re not staying within easy walking distance of the beach, there are many perfect locations with beach accesses and adjacent parking. Consider the central Children’s Park access at the Bight Beach, Stubb’s Point (also known as Pelican Point or Sunset Beach) or Emerald Point on Leeward Beach. Many of the island’s beaches offer minor yet interesting snorkelling sites such as rock jetties that shelter fish, sea grass beds, and low coastal cliffs. Boat excursions at Half Moon Bay Lagoon. Our favourite activity is taking a boat cruise. There’s a wealth of options: private and shared excursions, sailing and power vessels, dedicated snorkelling trips, and sunset cruises. 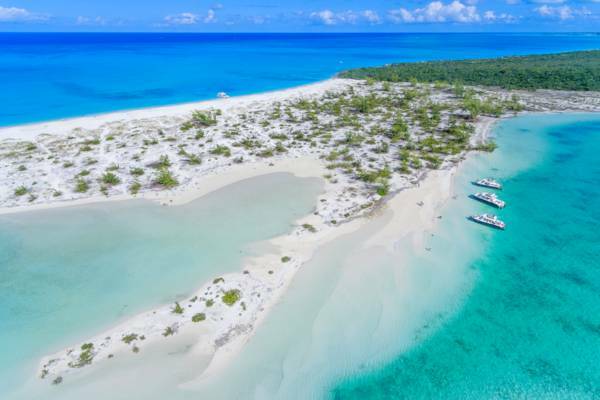 Top sights and destinations include Little Water Cay and the Turks and Caicos Rock Iguanas that live there, the incredible beach and lagoon at Half Moon Bay, Water Cay, Pine Cay, Fort George Cay, Dellis Cay, and snorkelling on the barrier reef. Cruise availability can be limited, especially private charters, so you’ll likely want to reserve well in advance of your visit. When out on the water near Providenciales, there’s always a chance that JoJo the Dolphin will be spotted! 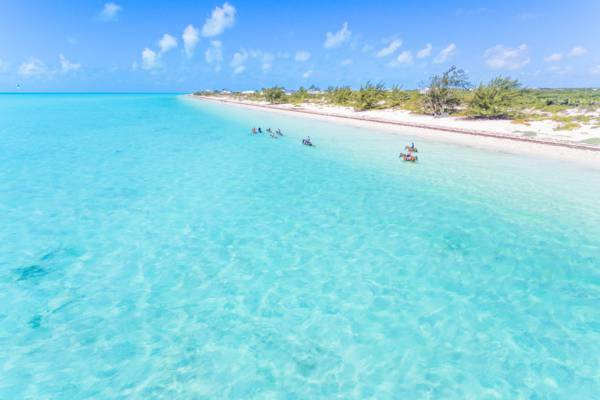 Several tours operate off the southwest coast of Providenciales, and visit a different collection of sights, including the small coastal cave and historical rock inscriptions at the scenic West Harbour Bluff, and the beautiful and secluded Bonefish Point beach. 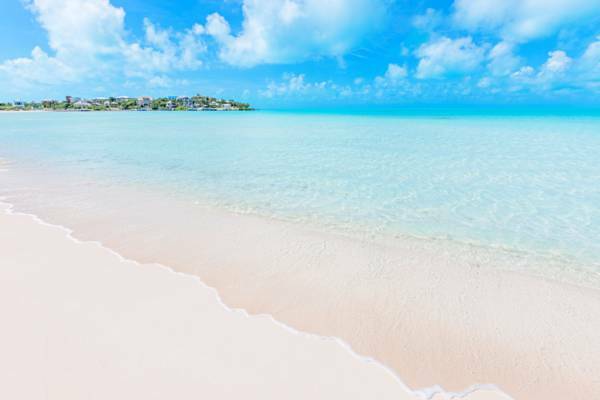 The tranquil Taylor Bay Beach on Providenciales. One of the wonderful and defining features of Providenciales is the island’s number and variety of beaches. Several smaller south coast beaches have shallow and calm water, and are perfect for kids. Sapodilla Bay is found between Sapodilla Bay Hill and Chalk Sound National Park. Due to its sheltered location, this exquisite beach offers some of the calmest ocean water on the island. The surrounding cliffs also offer interesting snorkelling, with small turtles and stingrays. The hidden Taylor Bay is also located near Chalk Sound. This coast is a little larger than Sapodilla Bay, and also features shallow, calm water, and soft white sand. Another beautiful beach that’s great to explore is Turtle Tail Beach. This small coast can be difficult to find, yet is tranquil and has little rocky cays off the beach that can be waded out to. Snorkelling at the barrier reef. Snorkelling is something that all ages enjoy. Kids usually don’t need the most spectacular reef to be kept interested, so it’s best to choose one of the sheltered snorkelling sites that’s close to the beach. The Bight Reef (Coral Gardens), is a good place to start, and is the most popular snorkelling site on the island. The reef start directly off the beach and is marked by buoys, so it’s easy to find your way around. The surrounding beach is also excellent, and an ideal place to relax at. Smith's Reef is a larger and more complex system near Turtle Cove. Much of this reef is too far out for children, yet two sections are found off the beach: one spot at the West Access, and at the East Access. It’s very important that children understand to not touch or stand on the reef. Doing so is very damaging to the delicate corals, and there are many fish, creatures and corals that are capable of giving painful stings or bites. Dangerous animals to be aware of are the lionfish, scorpion fish, and the many varieties of stinging and fire corals. Please only use reef safe sunscreen in the Turks and Caicos. Conventional sun screen have been proven to cause irreparable damage to reefs and the marine environment. Children will have the best time snorkelling when they have the right equipment, which includes long-sleeve rash guards to prevent sun burn, flotation vests, and a properly fitting mask, snorkel, and fins. When snorkelling from the beach, one hint is to start on the upwind side of the reef, and then simply drift over the underwater sights. Doing so will ensure that everyone won’t have to fight the current. At the central reefs on Providenciales, the upwind side of the reef is usually the eastern side. 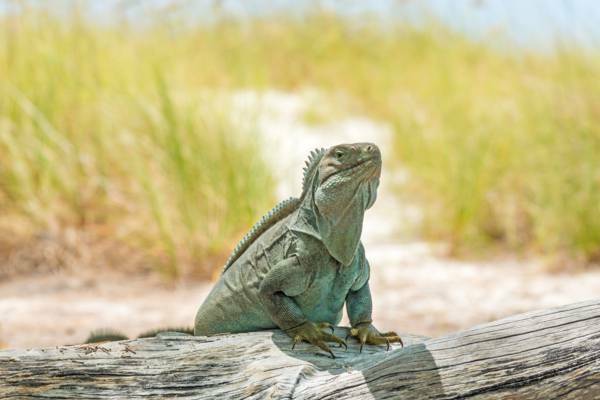 A Turks and Caicos Rock Iguana at Half Moon Bay. Another great things for kids to do is go on an eco-adventure or kids camp. Several resorts and tour companies offer excursions especially geared towards children. Big Blue Collective, the largest eco-tour company in the Turks and Caicos, allow hosts dedicated kid camps at times as well. There are so many ways to discover the environment. Excursions can be by boat, kayak, stand up paddle board, and bicycle. The mangrove wetlands that surround many of the Caicos islands act as nurseries to the fisheries. 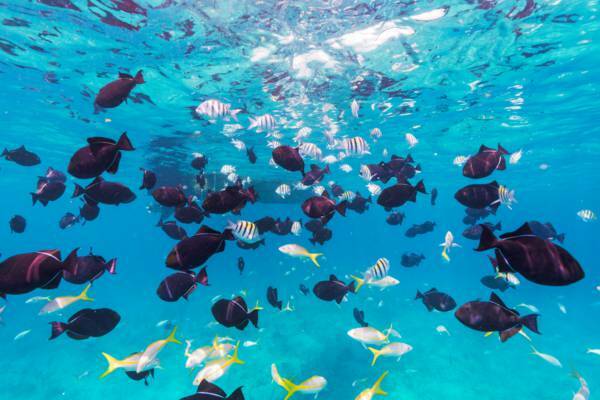 It’s common to spot juvenile fish, nurse sharks, turtles, stingrays, conch, starfish, and interesting birdlife. When the kids are out enjoying nature, it can be the perfect time to visit the spa or go shopping in Grace Bay! Horseback riding at Long Bay. A very popular activity with kids and adults alike is to take a local Potcake puppy out for a walk on the beach. Potcake Place, a non-profit animal rescue charity that’s located at the Saltmills Plaza, welcomes visitors to take puppies out to Grace Bay for a few hours of socialization and exercise. All of the Potcakes are available for adoption, so you may end up with a new pet! A great afternoon activity is to go horseback riding on the beach with Provo Ponies. This small stable rides on the beautiful Long Bay Beach, and there’s often the opportunity to ride in the shallow turquoise water too! As an alternative, a jet ski or boat rental tour is another great and exciting option. We advise arriving at the Providenciales International Airport three hours prior to departure during the winter and spring high season, and two hours during the low season. The Fast Track service is also available when departing. Hobie Cat sailboats and kayaks on Grace Bay Beach. What better time to capture family photos than during your vacation? There are several professional photography studios on Providenciales that cater to boutique vacation and wedding photography. Photo shoots are fun, and can even be done in the ocean with underwater cameras! The Undersea Explorer is a semi-submarine boat that tours the reefs near Turtle Cove. Long Bay Beach is one of the top kiteboarding spots in the Caribbean, and if the wind is blowing, it can be quite interesting to watch the show. The best spot is the public beach access near the Shore Club resort. The secluded Malcolm's Road Beach on the west coast of Providenciales is a great place for a day trip. There’s a tranquil beach, great snorkelling, beachcombing, and wildlife abounds. Be sure to bring plenty of drinks and snacks, as it’s easy to spend much of a day here. If you’re staying at a vacation rental or small hotel and want to have the resort experience, consider a day pass from one of the island’s all-inclusive resorts. West Caicos can be an excellent choice for kids that are a bit older. There’s great snorkelling, the historical ruins of a Victorian-era sisal plantation town, and exciting cliff jumping. Hobie Cats are small catamaran sailboats that are fun and easy to sail. Many of the larger resorts keep a few of the vessel for guest use, and there are a few places to rent them from as well.